The 2018 Sports Money Annual Summit and Awards Ceremony took place in Beijing on Monday. Hosted by Sports Money and the Forward Group, nearly 30 guests in sports business joined in the forum and presented their insights into the domestic sports industry and sports marketing. Sports Money, a domestic sports industrial information and trade platform, designed the event not only as a platform for people to spread their thoughts about the sports industry, but also to receive awards for their business achievements in the field. 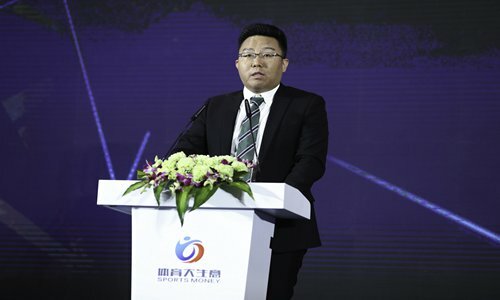 Li Tao, the founder of Sports Money, said in his opening speech that China's sports industry saw a positive growth in 2018 in terms of holding competitions, developing a capital market, extending copyrights, and he has good expectations for further development in 2019. "At a time when the industry seems to be cooling down, we can feel the vitality of China's sports industry from more than 1,600 successful cases of sports business operations shared during this summit, which gives us the confidence that we can do better in 2019," Li said. Also at the event, representatives from different sports companies shared their achievements in 2018 and their latest development strategies for 2019. Meanwhile, 15 annual awards were presented to the companies' representatives as recognition of their achievements.